Waco Professional Malpractice Lawyers Help You Sue Doctors Lawyers Etc. Today, Waco and McLennan County residents require the services of a wide variety of professionals to maintain their lives, from medical professionals to accountants, attorneys to stockbrokers, real estate brokers to architects. As opposed to in the past, when life was relatively simple, we now invest in the stock market, own all types of property, design and engineer complex structures, and undergo all kinds of surgery, from routine procedures to the most complicated of surgeries. When things go wrong due to no fault of their own, Texas residents need someone to turn to in their time of need. If you or a loved one have been injured and you believe that professional negligence, malpractice, or wrongdoing may be to blame, contact an experienced Waco professional negligence attorney today. Professional malpractice occurs when a service provider’s or other professional’s negligent acts cause harm or injury to a client or patient. Professional malpractice can extend to doctors, nurses, caregivers, hospice or elder care workers, dentists, psychiatrists, psychologists and other therapists, lawyers, architects, engineers, accountants, stockbrokers, real estate agents and other professionals servicing McLennan County residents. Specific examples of professional negligence or malpractice include breach of fiduciary duty, fraud, mismanagement, misconduct, carelessness, and errors in judgment that a reasonable professional would not have made under the circumstances. 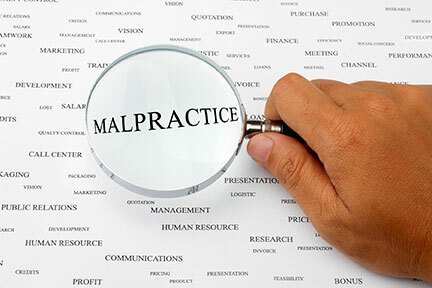 Most people think of medical malpractice first; however, various other forms of malpractice exist, including but not limited to real estate broker malpractice, stockbroker malpractice, and engineer malpractice. If a Waco, Texas professional has rendered services to you in a careless, unprofessional or otherwise inappropriate manner and you have subsequently suffered an injury — physical, emotional, or financial — you may be entitled to compensation. Contact a Waco professional negligence attorney to discuss your claim. Waco Medical Malpractice is perhaps the first type of professional negligence to come to mind for most people. Medical malpractice occurs when a doctor, nurse, or other medical professional injures or otherwise harms a patient through wrongdoing, carelessness, or negligence. Please visit our Waco Medical Negligence section for a full and thorough understanding of this area of Texas law. Doctors aren’t the only professional who cause people injuries when they fail to live up to the industry standard of professionalism and competence. Stockbrokers, real estate brokers, and other financial professionals can also wreak havoc on your livelihood if they are negligent or engage in unethical practices. These are people you entrust with your life savings, your business decisions, and financial planning for your family’s future. For more information on Waco, TX stockbroker & real estate broker malpractice, please visit that page. Just like doctors, your lawyer is held to professional standard. However, unlike doctors, your lawyer owes you a fiduciary duty. There are not a lot of lawyers who will get involved in representing a client against another lawyer. However, it is essential that if you have been injured by a lawyer's actions that you seek help. Please visit the Waco Lawyer Negligence page for a full understanding of this area of law.